Here’s a healthier take on the usual pan-fried chicken. I use half panko breadcrumbs for extra crunch, and half Italian-seasoned breadcrumbs for flavor. 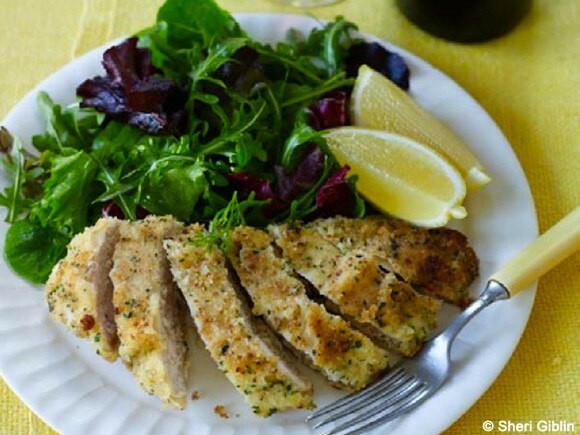 Serve it like they do in Milan, on a bed of undressed baby greens or arugula with lemon wedges. 1. Pat chicken breasts dry with paper towel. Put flour in shallow dish. Set aside. Whisk egg whites in new shallow dish. Set aside. Mix Italian breadcrumbs, panko, cheese, and parsley in third shallow dish. Set aside. 2. Coat each chicken breast one at a time. First, dredge the chicken in flour, shaking off any excess, then dip chicken in egg. Then press chicken into breadcrumb mixture, turning to coat evenly. Set the coated chicken on a wire cooling rack and let stand for 5 minutes to set the coating so it stays on during cooking. 3. Heat the oil in a large sauté pan over medium-high heat. Sauté the chicken for 3 to 5 minutes on each side, until lightly browned and an instant-read thermometer inserted through the side of a breast half into the center reads 165ºF. 4. Serve immediately with fresh lemon squeezed over the top. These were so much easier to make than I iminegad and baking instead of frying means we’ll add this to our summer repertoire! I cut basil and oregano from the garden to mix with the goat cheese. Next time I’ll add chive too. Thanks Gena!